No changes to the starting XI that had lost 1-0 at home to Charlton Athletic the previous Tuesday. "It's not about me. "@daRealAkinfenwa was reluctant to speak to the press, to make sure the plaudits went to his team-mates instead. Wanderers' first win in thirteen League games moved Gareth Ainsworth's side up to 17th spot in the table and opened a three point margin to the relegation zone ahead of the trip to Rochdale on Good Friday. 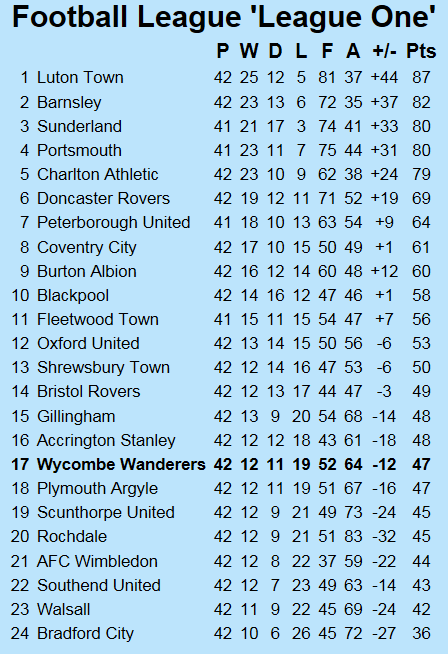 Wycombe leaped frogged Rochdale after the win at Southend coupled with Dale's 4-1 loss at Portsmouth.